More than just a memoir or a history book, Crash Course gives readers a unique firsthand look at the building of the American empire and the damage it has wrought. Shocking and gripping as any thriller, it exposes the endless deception of the American public, and reveals from inside how and why many millions of Americans have been struggling for decades against our own government in a fight for peace and justice. "A compelling memoir mixed with original historical research leading to fresh interpretations of the permanent war culture." "It's especially stunning for me personally, to read Franklin's gripping account of the era we both lived through--three years apart in age--and to realize that we followed the same unusual trajectory in beliefs and attitudes: both committed Cold Warriors at the outset--my service in the Marine Corps and working on nuclear war plans in the Pentagon overlapping his active service in the Strategic Air Command rehearsing the catastrophic enactment of such plans--his disillusion with the Vietnam war and his turn to active resistance shortly preceding my own. Readers of any age will find this an exciting and startlingly self-aware memoir of a life transformed in our dangerous epoch, and most will find in it radically new perspectives on these perilous times, up to the present mind-boggling moment. A terrific book!" "Only the late great Howard Zinn comes close to H.Bruce Franklin as truth-telling historian whose 'the personal is political' oeuvre should be read by every American, left or right, who aspires to be informed beyond headlines and rumor. Franklin’s Crash Course: From the Good War to the Forever War, meticulously researched, factually inarguable, is also a fascinating memoir in which the past is always prologue to the nearly out-of-body experience in which we find ourselves today. From 1939 through WWII to Korea to Vietnam to Iraq to Afghanistan to Syria to whatever is next: isn’t it time we figure out how we got here? 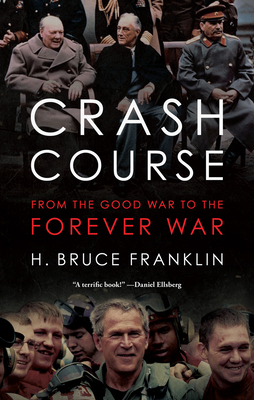 May H. Bruce Franklin’s incendiary Crash Course crash into discussion on every street corner, in every board room, classroom, and bedroom in these our United States, and in the world beyond." "Two threads are skillfully interwoven in this absorbing memoir: the record of a remarkable life, with rich and varied experience; and astute analysis of the background of critical historical events. The outcome is a fascinating picture of post-World War II America, all under the grim shadow of 'forever war.'" "Crash Course is a fabulous blend of exceptional memoir and astute political analysis. A quintessential American story of political coming-of-age. Highly recommended." "A scorching overview of the militarization of America that is simultaneously the engrossing autobiography of an historian who came of age in World War Two and the early Cold War years. Crash Course is a vivid and sobering eyeopener for readers at every level from students to fellow seniors to everyone in between." "A required course for everyone concerned about how militarization has shaped American society and national identity from World War II through interventions in Korea and Vietnam to the current endless war on terror. Especially engaging is the interweaving of personal memoir and political analysis, of social life and foreign policy, by one of our greatest myth busters." "Brooklyn boy, New York Longshoreman, US Air Force Navigator, English Professor, and human rights and anti-war activist, H. Bruce Franklin is one of our most important and enduring public intellectuals. Part memoir and part historical analysis, Franklin’s newest book explains how our 'glorious atomic victory in World War II' carried us relentlessly into the disastrous Vietnam War and our present campaigns in the Middle East and Afghanistan. Will we ever learn? Crash Course should be required reading by every American." "A passionate activist scholar, Franklin skillfully harnesses his lively and scrupulously candid autobiography to a deeply researched history of the emergence in the U.S. since World War II of what he calls the Forever War, which he places in compelling counterpoint to the growth of the wide-spread anti-war movement and allied progressive causes to which he himself was an important contributor. A terrific read." "Franklin’s mastery of the craft of writing has created a book where each element enhances the essential nature of the other. The story he tells here describes not only an epoch in the history of a nation and an individual, but also the consciousness that created that history." "This thought-provoking book will be of interest to readers seeking to understand America’s 20th-century history and its ongoing war culture." "[Franklin] has spent his adult life tilting at windmills, and our current situation suggests not much has come of his efforts, and those of millions of others. But, along with his wife Jane, whom he praises generously as his partner in activism and for her inspiration to him, he is persistent, and courageous, and has been around the block fighting the forces of brutality and militarism. We should hope to see more of his excellent scholarship and lucid writing in future years." "[Crash Course] is a blend of the life he's led and of the world around him since he was a kid. It's an irreverent story." "Crash Course is a highly entertaining read, and Franklin’s talent as a writer is unmistakable."